Note: While I wish I had the time to write a full-length review of this book, I don’t, so what you get is a kind of hybrid book bite/featured review. It’s hard for me to tell you just how much I loved Luna: New Moon. This is a hard bitten near future science fiction tale set on the harsh landscape of the moon, where air is purchased and lives are bought. Five powerful families rule the moon, including most if not all of the business that takes place, as well as the justice system and just about everything that is necessary for life. This creates an interesting political and social dynamic, a rough mafia world where social class could mean the difference between life and a rough, painful death. Intermixed in all of this is a ton of politics, of both the business/government and personal sort. One of my favorite things about McDonald as an author is his ability to create incredibly vibrant characters that practically leap off the page and captivate me. That skill of his carries over into Luna: New Moon. His rich, diverse tapestry of characters brings to life a lot of the social and political struggles that are faced in this novel, and make a lot of situations quite jarring. It’s one thing to hear that people who live on the moon have to buy the air they breathe, and too bad if they run out of money. It’s another thing to experience that worry and heartache, that slow torture, through a character that feels as real as you are. The plot is engrossing, and there is so much going on that keep things moving forward quickly. Mixed with that is the fact that McDonald completely pulls in his readers with his flawless prose and his well-realized world. There really isn’t anything to fault here. Once you start it, you won’t be able to put it down. So much hinges on simple things that aren’t quite so simple, like relationships between families, which quickly become a tangled, complex web. In fact, just about nothing is what it appears to be on the surface. Relationships aren’t just relationships, but complex political machinations that can cause vast ripples, and influence countless lives. It is quite genius how McDonald has managed to create a novel that is surprisingly human and relatable in so many ways, but incredibly detailed and thought provoking in others. There are a lot of wonderful things I could say about Luna: New Moon. I can pretty much boil it all down by saying that this was the science fiction novel I’ve been waiting for. It’s human, far reaching, thought provoking, complex, and relatable. It’s a tangled web of intrigue in such a well-realized world, I feel like I could live there. 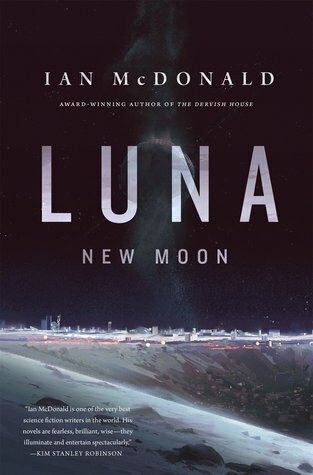 Ian McDonald really hit it out of the park with this one.